I opened this book not knowing anything about it except Colleen Hoover wrote it and the cover was gorgeous. There are some authors whose books you automatically buy and read regardless of the synopsis because you know no matter what the story is about, this is one of your favorite authors and it simply doesn't matter, you're going to read it. I figured it would have a fun, light hearted feel with a twist I didn't see coming. I'll have to say though this entire story was one big twist I never expected. 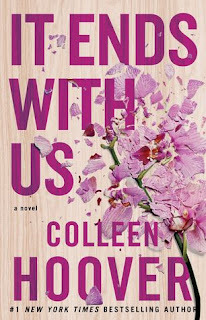 It Ends With Us is unlike any Colleen Hoover book I have ever read and totally different than what I expected. Yet, I still loved it every bit as much as I have her other books. This book was powerful and strong filled with many beautiful moments as well as some incredibly heartbreakingly ugly ones. 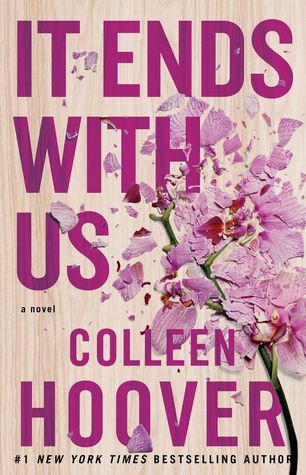 It Ends With Us is a very raw story which will have you just as confused as the characters who are questioning everything thing they thought they always believed. It's an important story, one that absolutely needed to be told and Colleen Hoover tells it like no one else. Her writing, her characters, the emotional roller coasters only she can create...it's all perfection. The heroine, Lily Bloom, (yeah, really) is such a powerful, wonderful character. I had no idea I would treasure her so much. She is the epitome of strength, honor and bravery. Since the novel is told from her POV, I easily connected with her. I was able to feel her emotions and struggles clearly in the present, as well as in the past, thanks to some wonderful journal entries she finds herself re-reading to try and gain closure with her abusive late father and her first love. Lily meets Ryle Kincaid in the first chapter of the book at a point in time where they are both struggling with the ramifications of a bad day. He is a cocky neurosurgeon who wants nothing more than to get in Lily's pants. Ryle has such a fun magnetic personality you easily fall in love with him. His humor and the way Lily gets under his skin is nothing short of endearing. Ryle, however, has some skeletons in his closet that cause him some issues. Will love overcome tragedy? While you are in the present, you are also experiencing the past with Lily. You see, her first love was a homeless boy named Atlas. The story that unfolds in the past intersects unexpectedly with the present and Lily's world is turned upside down. How can she find closure on the past when it seems to be repeating itself? I adored all the characters in this book; specifically, Issa. The bond that is forged between best friends is sacred. The fact that Issa can see everything clearly and not lose sight of what is important, makes her an incredibly important figure in Lily's life. She is one of my most favorite book characters right now. Good friends are hard to find, but Lily found one in her. Love comes in all forms, whether it be a new romance, an old flame, love between a parent and child or just having the common decency to do the right thing when someone is in need. I hope I can grow up to be like Lily one day. I encourage all women to read this book and to make sure their friends and daughters read it. Be brave and bold, don't be afraid to make difficult decisions, but buying and reading It Ends With Us shouldn't be a difficult decision, just go ahead and one-click it.